Veeam will launch a new program in January 2014 (launching first in North America and EMEA) that will educate and certify partners and end-user engineers as Veeam Certified Engineers (VMCE). The designation of VMCE establishes a level of expertise required to implement and configure Veeam software correctly and most effectively. 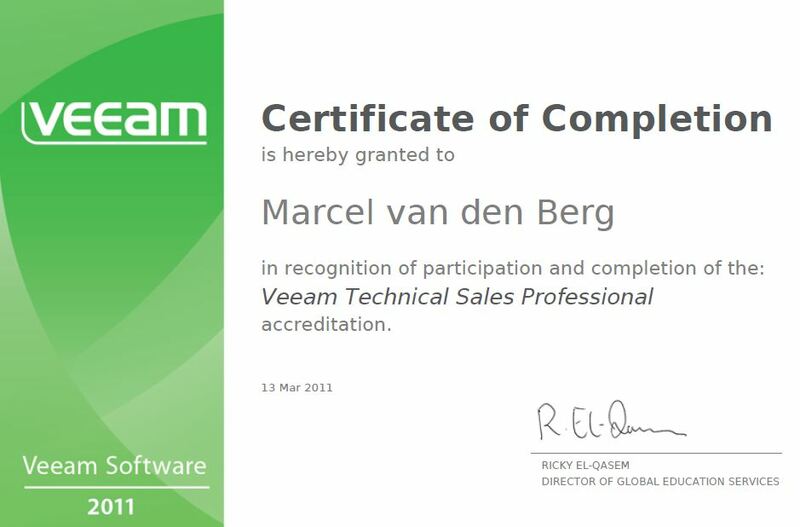 The designation also verifies the engineer has the necessary knowledge and experience to be hired as a Veeam Expert. Distribution partners of Veeam will be selected as Veeam Authorized Education Centers (VMAEC) to deliver fee-based education courses with a curriculum developed by Veeam. For those who cannot attend the three-day instructor-led live training, Veeam is piloting a Video on Demand Learning (VODL) module in North America. Every class includes both lecture and hands-on elements that allow the students to learn about the technology and its configuration, and then experience the configuration in labs based on real-world customer scenarios. All VMCE candidates must pass a proctored exam as the final step in earning their certification. Veeam expects 1,000 – 2,000 engineers to earn the VMCE distinction within the next year. This new certification program is designed to support the systems engineers of Veeam customers, as well as the pre-sales engineers of Veeam’s network of ProPartners, with high-level technical competencies through delivery of technical courses required to achieve VMCE certification. Veeam will empower its North American and EMEA engineers specifically by providing education on Veeam product capabilities, their interaction and alignment with compatible technologies, and both onsite and online instruction on how to most effectively implement Veeam to achieve maximum functionality. This training will include certification programs that will enable the reseller to offer and deliver highly profitable professional services, and enable the customer to further optimize its investment in Veeam solutions for a much higher ROI and improved SLAs (Service Level Agreements). BANG. The message which Microsoft delivered Friday August 30 10 PM must have shocked many Microsoft certified man and women. Microsoft will retire its top certification Microsoft Certified Master, Microsoft Certified Solutions Master, and Microsoft Certified Architect certifications. No more trainings and exams per October 1, 2013. For those unaware of these certifications: it is the most highest level of certification on Microsoft solutions you can get. It is compareable to the VCDX program at VMware. However I believe becoming Master or Architect is even more difficult. People have to pass a couple of exams, and do a qualification lab (things are broken and the Master wannabee needs to fix) and attend about 3 weeks of internal trainings at Microsoft (not required but very much needed to pass). Microsoft has Masters on Active Directory, Exchange, Lync, SQL Server and Sharepoint. The number of Masters on for example Exchange is around 250 worldwide. Michael van Horenbeeck writes about his experience while doing the MCSM:Messaging Certification. So there is no clear reason given besides ‘the IT industry is changing rapidly’ . Wait a minute, haven’t we heard that before from Redmond? Yes, at the start of July Microsoft announced the retirement of its TechNet subscription; a low cost offering of software to IT-professionals for study and demo purposes. cust costs and/or earn more money. 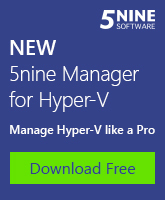 I believe the TechNet software being available quite cheap made it easy for illegal usage of the Microsoft software. I am note sure about the financial benefits of retiring the top certifcation. To attend the employee of the participant needs to pay a lot of money (travel, hotel, the Microsoft fee for three weeks of training (somewhere around $ 20k), lost of revenue because employee is three weeks on training etc.). It could well be the number of attendees for the Master and Architect training was at such a level Microsoft does not make money. Did Microsoft also count the loose of image, bad press, an upset community, conspiracy theories? Pointing the IT-professional to a direction. Microsoft is changing from a company making products to one delivering services over the internet. Azure is designed, Office 365 as well etc. The demand for smart people in architect roles needed to help organizations design their on-premise infrastructure will decline in the coming years. Although this will take quite some years. Another possible reason for retirement of the top-level certification is that HR people do not know this program very well . Lack of request is lack of demand for training is reduced revenue for Microsoft. The timing of bringing this news out is a bit weird! Microsoft sent out an email message on Friday evening 22:00 Redmond time. One of the members of the MCSM:Messaging and Microsoft employee Neil Johnson (who is also an instructor on the Messaging 3-weeks training in Redmond) then broke the news by writing a blog post about it. On Monday the US is on holiday because of Labor Day. Maybe some complot thinking buy why would Microsoft sent out this sad news just before a three day weekend? To get under the radar, hoping on Tuesday the news will be less noticed? With the recent de-coupling of training and exams for the other technologies (SQL Server has been de-coupled for some time now) we anticipate a much higher volume of candidates taking the exams. We realized that the limited number of Prometric Test Centers in the past limited our ability to get the exams to you. We have just completed an exciting expansion of Prometric Test Centers that are eligible to administer our exams. The list now numbers over 500 test centers. The Microsoft community is very upset. One of the best of many posts is this one written by Bhargav Shukla, a Microsoft Certified Master on both Exchange 2010 and Lync 2010. More examples of reactions from the community are here , here , here and here. The UC Architects which make a regular podcast about Exchange, Office 365 and other UC topics spent an entire episode on this matter. It was recorded on Sunday September 1 and will be available soon here. There are many more blogs written. There is a Microsoft Connect item where the community can discuss here. It is a long explaination and a must read to understand why Microsoft decided this. During Saturday many more people expressed their feelings in blogs. There are many questions to be answered. One thing is sure; many very knowledgeable & passionate people are sad. I think this is a penny wise, pound foolish decision. As of July 19, 2013, all VMware certification exams will require authorization from VMware before scheduling an exam. VMware certification exams are delivered by a third-party testing vendor, Pearson VUE. Pearson VUE will require prior authorization from VMware before exams can be scheduled. VMware will authorize candidates upon validating email address and checking that the pre-requisites for the certification have been met. Authorizations will be processed automatically for you from vmware.com/certification. Untill July 19 2013 the entry level exams (VCP4 and VCP5) could be booked without authorization. Other exams already required authorization. The authentication takes between 15 and 30 minutes. more information on certification here. VMware announced a new training offer for attendees of VMware classroom courses. After completing the course, students are able to use a training lab environment hosted in the cloud for 30 active hours or 30 days. This enables them to learn and digest the information in the course at their own pace and comfort. The lab is available initially for USA students who attend a VMware-delivered VMware vSphere: Fast Track [5.0] or VMware vSphere: Install, Configure, Manage [5.x] class. Europe, Asia Pacific, and Japan expect to release VMware Lab Connect in Q1 2013. End of March Microsoft gave a free online Jump Start webinar on Microsoft virtualization solutions. The webinar lasted three days and each day around 8 hours of training were given. The recordings of these sessions are now available! See them here. These are recorded in Silverlight. More information about the content of the sessions in this posting. But it doesn’t end here! By completing the Transition to ESXi Essentials course and the short survey that follows at the end, you will also receive a FREE ebook copy of “VMware ESXi: Planning, Implementation, and Security” authored by Dave Mishchenko and edited by VMware technical experts. Dave’s book is truly a phenomenal resource for all VMware users to learn everything there is to know about ESXi. While the Transition to ESXi Essentials course will remain available for free in the VMware Education Services portal, we’ll be able to also offer Dave’s book for free only while supplies last. So, hurry up, complete the training and turn in your survey as soon as possible! The book has been available as a paperback for a while now. In the beginning of April Frank and Duncan decided to make the book available as an e-book as while. They choose for the Kindle format as there is an application able to display Kindle format for a lot of devices (Pc, iPad, iPhone, Android and the Kindle reader itself). The book is downloaded to the Kindle app and ready to be read! Duncan writes about the process on deciding to create an e-book version of the book and the steps needed at his website. It is as simple as that. I have just bought our book so that I can read your public notes, so take it away! 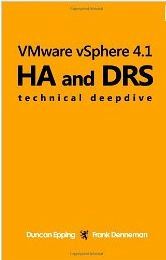 I started reading the vSphere Design book this week and I have added some notes already. I will try to make notes for books each book I buy / read and share them with you and hope all of you will do the same. a sales tracks (VMSP) and a technical track (VMTSP). Both are offered for free on the Veeam University section of the ProPartner portal which is available for all Veeam Partners. To qualify for Veeam Silver ProPartner your organization needs to have 1 sales person holding the Veeam Sales Professional certification. 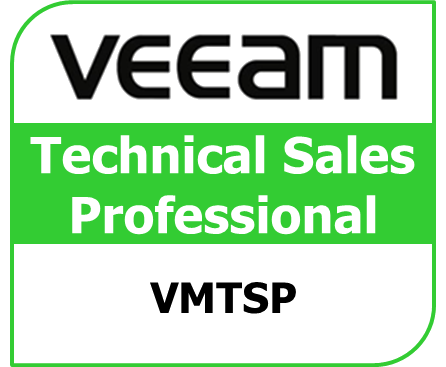 To qualify for Veeam Gold ProPartner your organization needs to have 2 sales persons holding the Veeam Sales Professional certification as well as two pre-sales or technical consultants having the Veeam Technical Sales Professional (VMTSP)certification. The VMTSP has 11 modules which cover Veeam Backup & Replication, Veeam Monitor and Veeam Reporter. The modules are presented using Adobe Presenter and learn about architecture, features and benefits, usage examples, deployment and troubleshooting. The length of each module varies. The longest one is 48 minutes and the shortest is around 10 minutes. If you want to go through all the slides of each and every module of the VMTSP-track you will need around 6 hours. A few modules end with a quiz. To certify you will need to pass 80% of the questions. There are 5 questions in each quiz and you can repeat the quiz as many times as you need. The questions are very easy to answer. I really liked the modules! 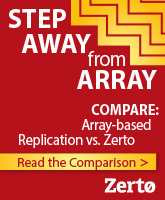 They give a clear, good overview of the features of B&R, Monitor and Reporter. Going through the modules is a must for every sales, pre sales and technical consultant of any Veeam Partner. It will certainly help you in selling, designing, building and supporting the Veeam products and your clients! The reward for your time is a nice certificate and logo’s as can be seen on the righthand side of this window ;-). Also you can enjoy other benefits as can be seen in the sales program. Cloud computing will involve new roles for IT-staff. EMC Education will soon start offering coures targeted at cloud computing. The new trainings are very popular as they are booked full till October 2011. The EMC-proven professional certification tracks for Cloud Architect (EMCCA) include virtualized infrastructure and IT as a service. The Data Center Architect (EMCDCA) tracks focus on storage networking, information availability, information storage security and storage service manage-ment. These latter courses reflect EMC’s storage heritage, but are still key in helping domain architects flesh out ideas that the cloud architects will bring to them. Courses are expected to take about a week each and cost roughly $5000. This is a brochure on the training. More info can be found on the EMC Education website.